For those of you that don’t know me personally, you couldn’t yet know how much I love Christmas. It is my absolute favourite time of the year. I think it took even my husband by surprise – he’d seen my parent’s home decorated for Christmas, and my sister’s home but when we married and celebrated our first Christmas in our own home, I don’t think he was quite prepared for the onslaught of Christmas cheer! And having children has only made it worse. They are old enough now to love decorating and they egg me on to get more decorations each year (I’m proud to be passing this Christmas spirit down to the next generation!). However, being a face painter means that this time of year is also my busiest time of year, and to survive it all, I have to be super organised and think ahead about everything. 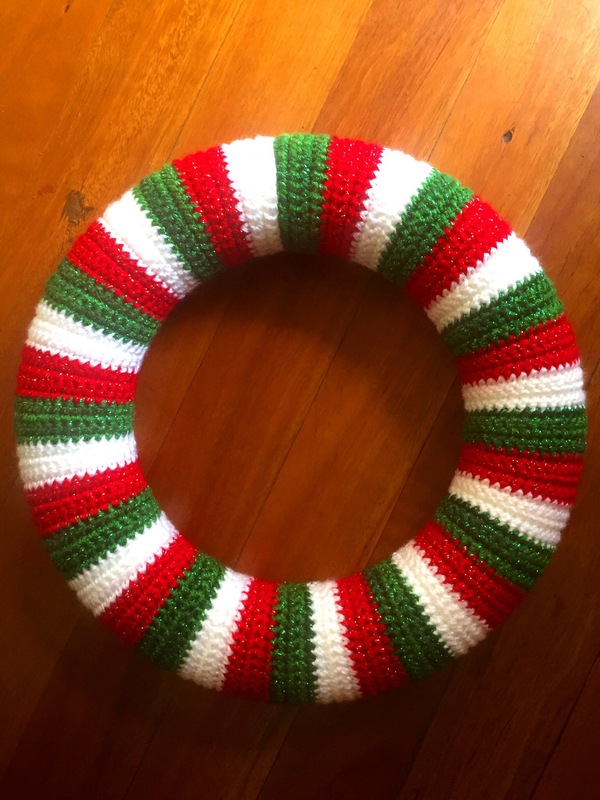 This year, I decided to make a wreath for our home. My plan was to put it on the front door, but it gets a lot of sun, and I’m worried that it will fade and render all my hard work useless, so it’s final display place is still up for debate. I got the basic idea and instructions from this Attic 24 post http://attic24.typepad.com/weblog/2012/12/christmas-wreath-ta-dah.html, where she covers a foam wreath and decorates it with Christmas bits and bobs. I decided to go a little more traditional with my colours, and used the Kringle Sparkle yarn from Spotlight. I’ve doubled the strands because it is quite a thin yarn (I’ve had this in my cupboard for a year or more and have been told that this year’s batch is a little thicker!). I’m loving it so far. It is so beautiful and sparkly and Christmassy! My plan is to add a Scandanavian Santa Gnome (https://www.1dogwoof.com/scandinavian-santa-gnome-amigurumi/) and some holly etc. once the wreath is finished. It is getting hard working on just the one project – I’m so tempted to put it aside and start on another (or I should finish another wip! ), but I’m determined to finish it THIS Christmas, so that is spurring me on (and putting it out here will also hold me accountable!). I’m quite excited to see how it will turn out! It may have to feature in one of our Barbie escapades (we don’t do elf on a shelf – our Barbie dolls come alive during December!). Are you thinking ahead for Christmas? 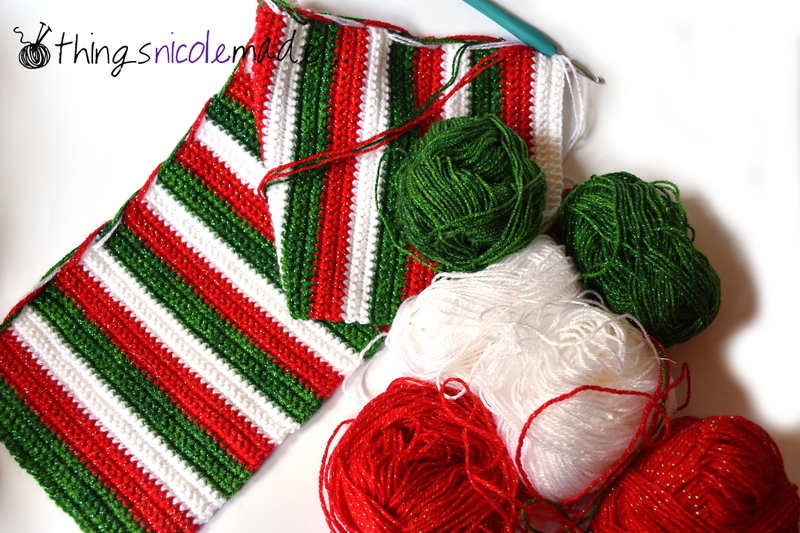 I’d love to see some of your Christmas projects (and get more ideas!). 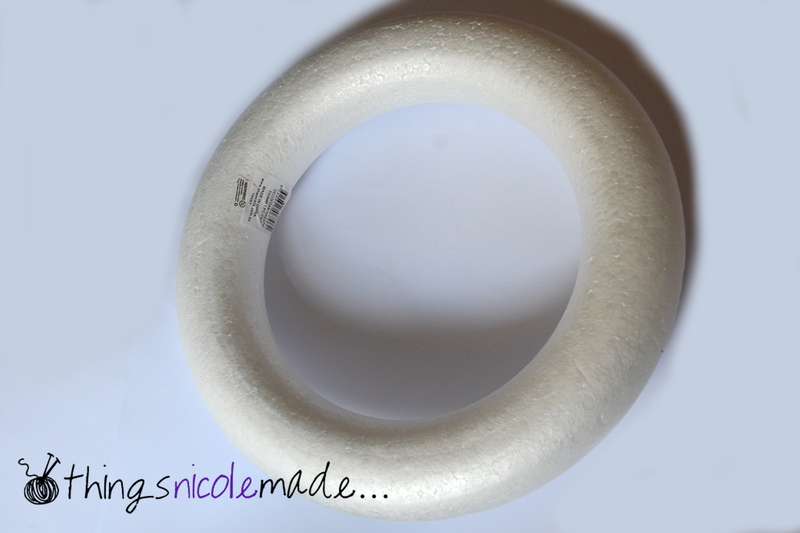 Please share them in the comments, or on my facebook page https://www.facebook.com/thingsnicolemade/. P.S. I wasn’t expecting to finish this so quickly, but was so excited I had to add it to my post before it went live! I’ve finished covering the wreath and I’m stoked about how it’s turned out!